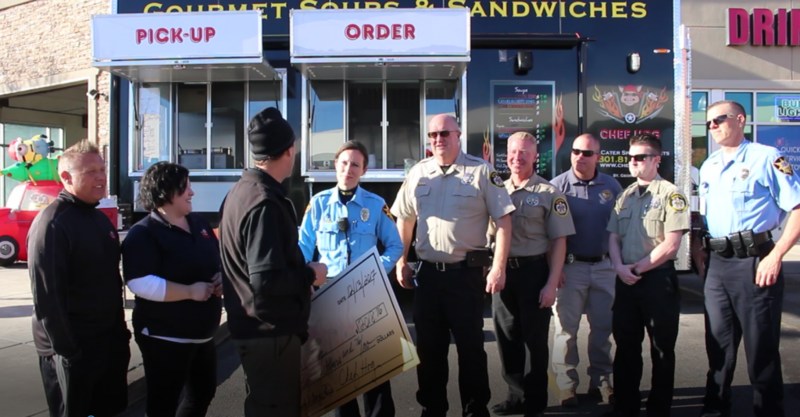 ST. GEORGE — A check was presented Wednesday to the “Shop With a Cop” program from a food vendor who partnered with Fabulous Freddy’s on North Bluff and embarked on a fundraising blitz to bring Washington County children a brighter Christmas. The check for just over $2,000 was presented to Washington County Sheriff Cory Pulsipher and St. George City’s Deputy Chief of Police Richard Farnsworth in the parking lot of Fabulous Freddy’s at 806 N. Bluff Street, near the Chef Hog food truck. 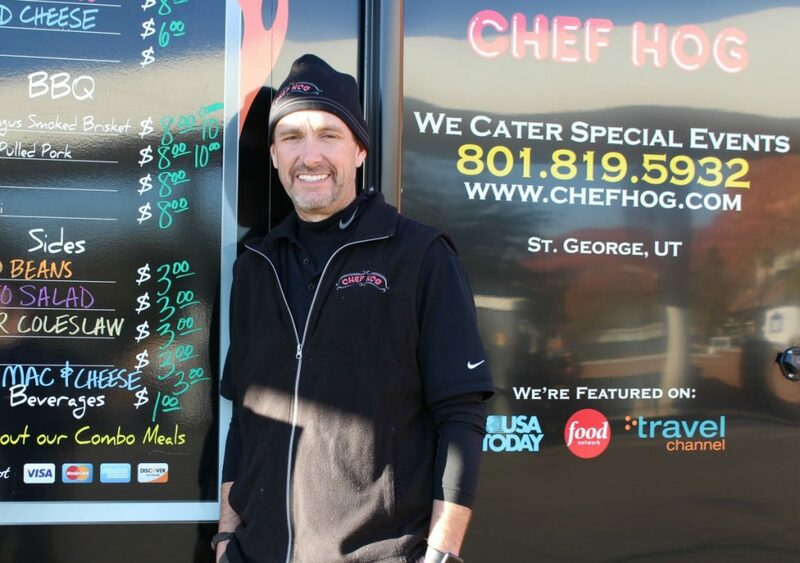 Chef Hog is a family-run food truck and catering company specializing in barbecue, Greek and American style cuisine. 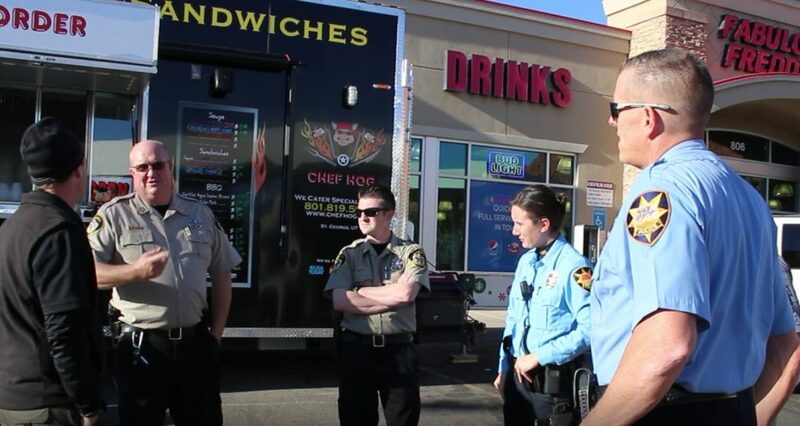 Jeff Germain, owner of Chef Hog, began a campaign along with Fabulous Freddy’s management to raise money for the upcoming Shop with a Cop event after contacting the Washington County Sheriff’s Office requesting information on how they could help the community through one of the law enforcement charity programs. 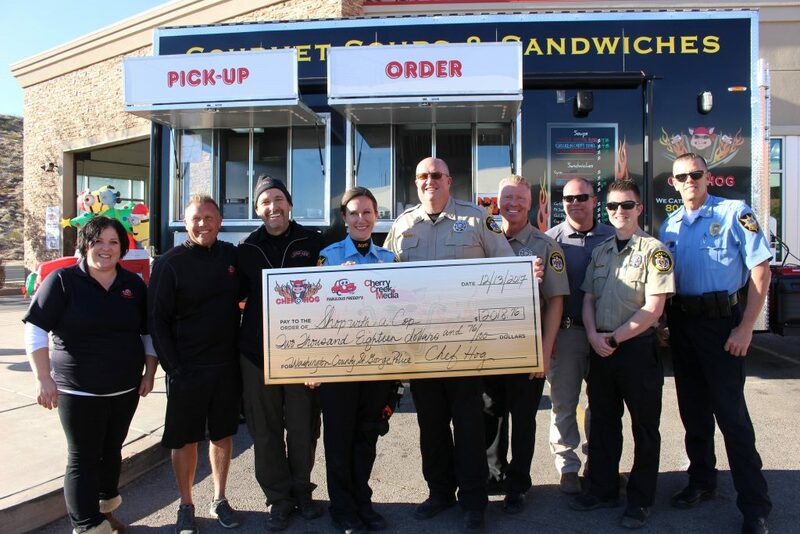 Less than two weeks later and just in time for the Shop with a Cop event on Saturday, Chef Hog and Fabulous Freddy’s, along with support from Cherry Creek Media, presented the funds to law enforcement at the impromptu gathering. It’s our community that came out, it wasn’t us; we’re just here but it made a great Christmas for my wife and I to present this check. The money presented Wednesday will be used to fund a morning shopping spree where the child accompanies a police officer to one of the local Walmart stores, where they pick out the toys or other items they would like for Christmas. Each child is allotted $150 in spending money, which is placed on a gift card and used to pay for the purchases made Saturday. Officers throughout Washington County came together with the goal of sponsoring at least 100 children, Pulsipher said. “It’s such a heartfelt, warm thing for him to reach out and want to help with this, and he’s gone on a social media thing and reached out to businesses and the community,” Pulsipher said. Fabulous Freddy’s supported the effort by promoting the cause and accepting donations at the store on behalf of Chef Hog, said Brett Warnick, Fabulous Freddy’s operations manager. The names of the children participating in the Shop With a Cop program were provided by Kony’s Coins for Kids, a nonprofit organization that provides Christmas presents for less fortunate children in Washington County and oversees the application and screening process to determine eligibility. Once that process is completed the names of eligible children are provided to the Shop With a Cop program. Kony’s Coins for Kids provided the names of 102 children who will participate in this year’s event, which begins with a breakfast at the Washington County Legacy Park. 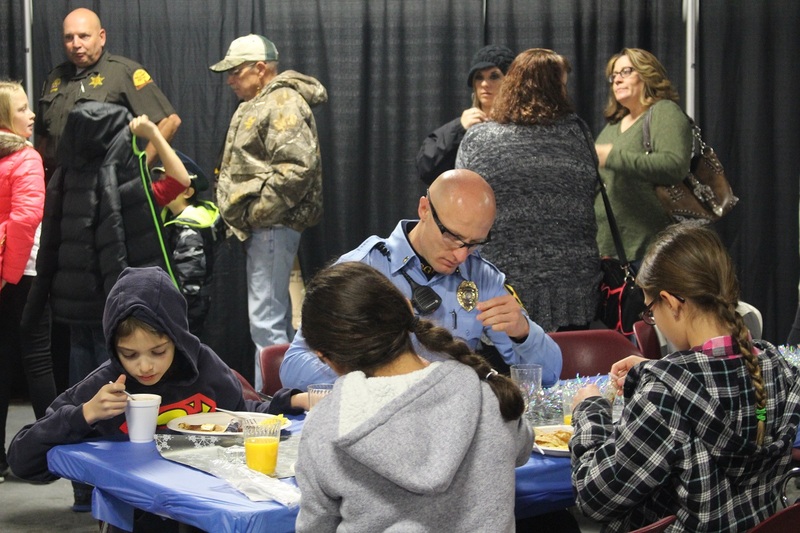 Last year, more than 300 participants – including law enforcement officers and community members both young and old – gathered together here to fuel up before the mega shopping spree. 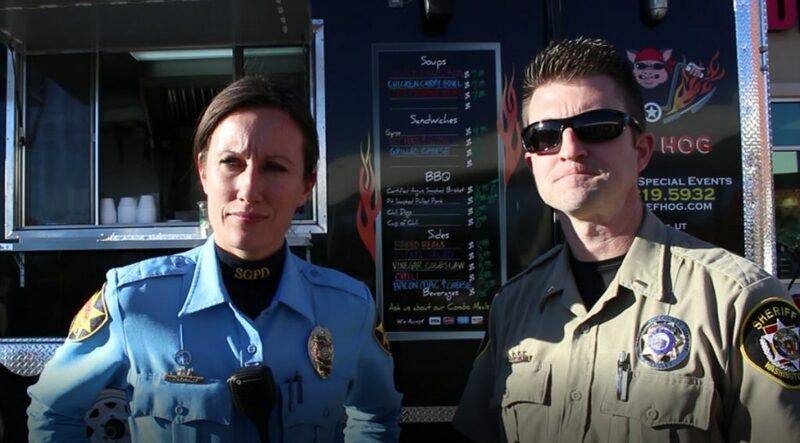 Officer Lona Trombley, 12-year veteran of the St. George Police Department, has participated in the program for 11 years, including acting as program coordinator for the police department for the past eight years. Trombley said every police agency in the area is growing, so the number of officers who participate in the program has grown as well. This provides additional opportunities to procure funding, which means a higher number of children helped. Trombley is responsible for coordinating the volunteers and donations for the city, while Lt. Brock Bentley oversees the program for the sheriff’s office. “We have officers from every agency in Southern Utah who are going to participate in the program this year,” Bentley said, adding that it takes about $15,000 to provide for all of the children. 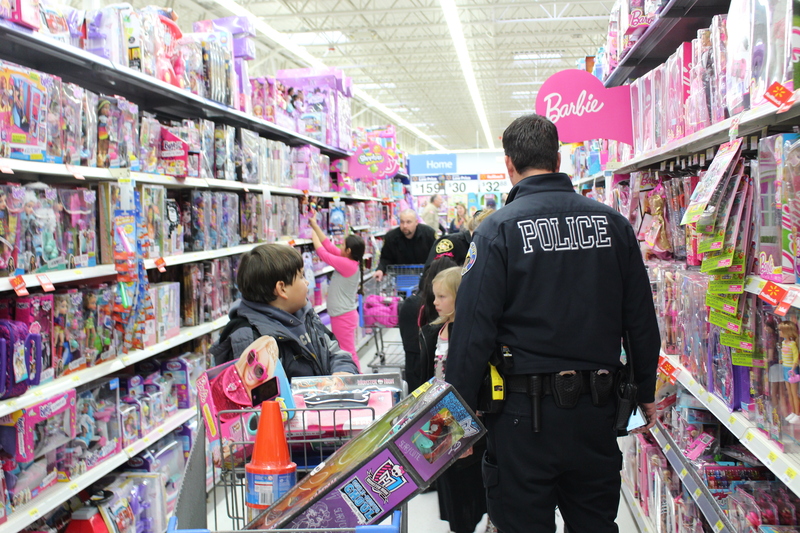 Designed to benefit as much of Washington County as possible, officers from St. George, Santa Clara/Ivins and Washington City police departments will shop with children from the west side of the county, while children on the east side will shop with officers from Hurricane and LaVerkin police departments, Springdale Department of Public Safety and deputies from the Sheriff’s Office. Officers from Adult Probation and Parole, Sand Hollow park rangers and even FBI agents are also involved in the program. Walmart also plays a big role, as all three Washington County stores participate by providing volunteers who work the registers and sectioning off different areas of the store to assist in the shopping experience for both the children and the officers. Once purchased, the gifts are wrapped by volunteers from the Washington County Explorer Program using supplies donated by Walmart and then delivered shortly before Christmas. Without the support of the community, business partners and private individuals, the program would not be possible, Pulsipher said. The Shop with a Cop program is important for various reasons. Besides providing for those in need, it also allows children to see a different side of the officers and can create a bond between the officer and the child. It also allows an opportunity for the officers to interact with the children in a positive environment and make an impact that can last a lifetime. Brock Bentley…IS MY HERO! GO FALCONS!